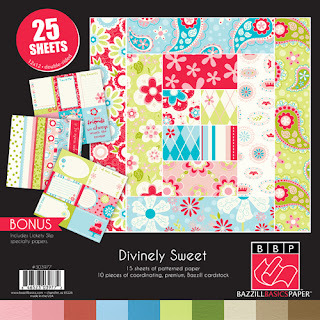 Some time ago I purchased the 12 x 12 paper pack Divinly Sweet by Bazzill. There are some fun and funky papers as well as coordinating plain card stock and bonus Lickity Slip border and journaling pages. As a card maker I knew the papers would be perfect to create some bright and cheerful cards. As a scrapbooker who doesn't do a lot of journaling, I needed to find another use for the bonus pages. So I got busy and created this set of quick cards using only the papers from the Divinly Sweet Paper Pack, a few embellishments, JustRite Stamps, Spellbinders and some Bazzill white cardstock.